Every organization is aware of the importance of customer-centricity. Delivering a great customer experience is a priority for many companies. To achieve this, all sorts of methods are used to take the customer experience to the next level. However, too little attention is paid to one key aspect: leadership. 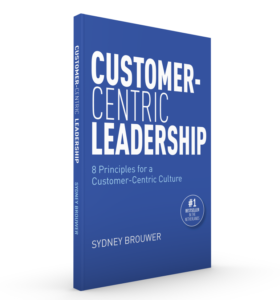 In this #1 Dutch Bestseller, Sydney Brouwer links customer-centricity and leadership. He zooms in on the role of the leader. After all, as a leader you are responsible for creating a culture that encourages everyone to understand and act on the interest of the customer. What should a leader do to make customer experience a priority for everyone in the organization? How can he enable and encourage customer-centric behavior? By using inspiring cases and examples from companies like Disney, citizenM and BMW, Sydney takes you on a journey along eight principles that will help leaders build a customer-centric culture. A culture that creates enthusiastic customers and employees. Sydney Brouwer is an expert and highly sought-after speaker in the field of customer experience and customer-centric organizations. Over the past years, Sydney has analyzed customer-centric companies and their leaders. He is founder and board member of CX Circle, a Dutch networking organization for customer experience professionals. Ron Kaufman, NYT Bestselling author and founder of Up Your Service! Customer-Centric Leadership is now available on Amazon.com. Click on the link below to order your copy.